To see how capacity is being utilised within vSAN can be found under the hosts and cluster view in the vSphere Web Client. Select the vSAN cluster object, click monitor (1), select the vSAN tab (2), then select the capacity sub menu (3) on the left hand side. 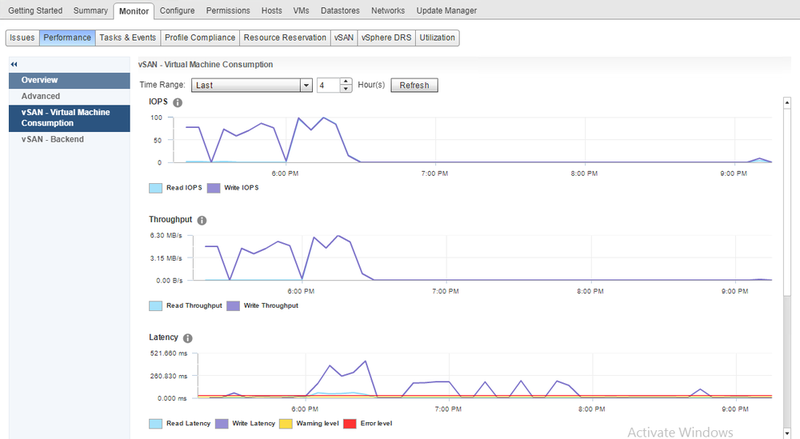 This view shows a detailed breakdown on how the capacity has been consumed on the vSAN datastore. This includes both capacity consumed by virtual machines along with overheads such as file system, deduplication, performance management and checksum. It’s always a good idea to perform some form of benchmarking when deploying any new storage solution. Recording a baseline level of performance gives you something to compare against in the future for troubleshooting or calculating growth requirements. This may have been done using something like IO meter to generate a specific workload patterns on the array. vSAN 6.6 has a built-in function called Proactive Tests and allow you to run several performance tests on the vSAN cluster to ensure it is ready for production use. vSAN 6.6 has a comprehensive health service that proactively monitors the state of the vSAN cluster to ensure everything is functioning and configured correctly. By default this is configured to run every 60 minutes and will raise alerts if any issues are found. There is a useful feature called “Ask VMware” which brings up the relevant KB article with details on how to remediate the issue. Having a stable and healthy vSAN cluster requires the configuration, device firmware and device drivers. vSAN 6.6 now includes a configuration assist option to check hardware compatibility, burn-in tests, network configuration, vSAN configuration and cluster recommendations are all correct. To simplify the process of patching and upgrading vSAN clusters there is now full integration with VUM. In previous versions there was a fair amount of manual work involved when checking which firmware versions were supported on the VCG. 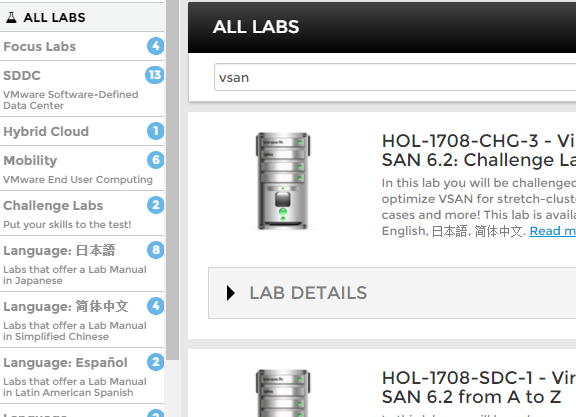 Now this information is displayed within vSAN health using the vSAN Release Catalogue hosted by VMware. When a new update becomes available this is reported directly in vSAN using a notification. There are many graphs available within vSAN providing granular performance metrics at the cluster, host, network adapter, virtual machine and virtual disk level. As you would expect you can monitor common statistics such as IOPS, throughput and latency along with vSAN related information such as free write buffer space, cache de-stage rate and congestion. There is the ability to look at data from the last 1 – 24 hours or select a custom time and date. It is also possible to save this data. The vSAN performance service is enabled on the cluster with the database being stored as vSAN objects. Much of the information I’ve used throughout this series has been take from a couple of whitepapers that can be found on the VMware Storage Hub. For a deep dive into vSAN I’d certainly recommend a book written by Cormac Hogan and Duncan Epping called “Essential Virtual SAN (second edition)”. Whilst this is written for vSAN 6.2 the content is still very relevant. If you prefer the “learn by doing” approach then I’d encourage you to check out VMware’s Hands on Labs. This is free to use once you’ve signed up for an account and has several labs that are focussed on vSAN. It’s fair to say that this series is longer than I anticipated but I believe this highlights how much development has gone into vSAN over the last few years and is certainly an option you should consider for your next datacentre refresh project. If you would like to find out more on how ComputerWorld can help you then please get in touch.